Saint-Saens: The Swan (Le Cygne) movement 13 from the Carnival of the Animals Suite. Duration: 2:50 Score: 5 pg, 28 ms. Solo part: 1 pg. 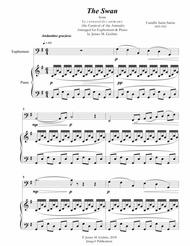 Piano part: 3 pg. Performance: Level: Early intermediate and up. 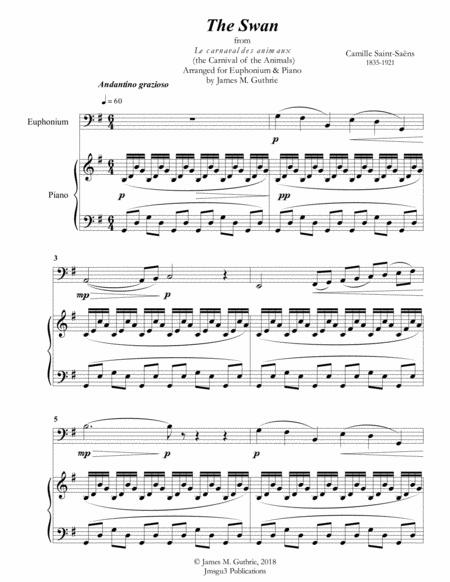 One of his most popular and widely recognized works, it is the only movement from the Carnival Suite which Saint-Saens permitted to be performed in public during his lifetime. This is an excellent recital encore choice to demonstrate melodic playing and strategic phrasing. The Carnival of the Animals is anentertaining musical suite of fourteen movements by CamilleSaint-Saëns. The work was composed for private performance by an ensembleof two pianos and solo instruments. The Swan (No. 13) is one of the mostpopular of the fourteen movements. In its entirety, it and lasts about 25minutes. Charles-CamilleSaint-Saëns 1835 – 1921) was, by all means, in particular, a famousFrench composer, brilliant organist, and significant musical mastermind ofthe Romantic era. Certainly, his most famous compositions, in the long run,include his Piano Concerto No. 2 (1868), Cello Concerto No. 1 (1872),and the Danse macabre (1874). Notwithstanding, we mustalso add the Violin Concerto No. 3 (1880), Symphony No. 3 ("the OrganSymphony, 1886") and, it must be remembered, Carnival of theAnimals (1886) to the list. It is important to realize thatSaint-Saëns was certainly, in fact, a child musical prodigy. Consequently, withthis in mind he made his concert debut albeit at ten years old. Anotherkey point to remember is that he expressly studied at the ParisConservatoire, then in spite of reality conversely followed a traditionalcareer path as a church organist. Nevertheless, twenty years later, onthe other hand, he left to become a successful freelance pianist and composerdespite, as has been noted, his former employment situation. Furthermore, hisperformances were after all markedly in demand - not only in Europe but aboveall in the Americas all in all as well. A point often overlooked in that inhis youth, Saint-Saëns was certainly excited about the modern music of theday. He was in essence fond of the music of his contemporaries, inparticular, Schumann, Liszt and for the most part Wagner. In contrast,however, his own compositions seemed in fact largely confined within theconservative classical tradition. Be that as it may, he was at the same timenevertheless, in fact, a scholar of musical history. On the whole, his conservatism infact ultimately brought him into frequent conflict in his later years withcomposers of the impressionist and in particular thedodecaphonic schools of musical thought. A point often overlooked isthat contrary to some critics, he included neoclassical elements in hismusic. Furthermore, in so doing he provided the most compelling evidence thathe predicted the techniques and works by Stravinsky and LesSix. To put it another way, given these points, he was regarded, perhapsfor the most part unfairly so, as a non-progressive reactionary hencefortharound the time of his passing. To sum up, Saint-Saëns taught for ashort time in Paris, where his students included namely Gabriel Fauré. Toclarify, Maurice Ravel later studied with Fauré. In conclusion, both Ravel andFauré were powerfully influenced by Saint-Saëns, whom they respected as amusical mastermind.